What do you do when the people around you have different moral standards than you? Now what do you do if those people are your friends and family? That’s an awkward situation for anyone, but especially for a nineteen-year-old living in the limelight. Erin wants to do the right thing; she tries to honor God in all she does. But with her best friend about to become a teen mom, her sister shacking up with a fiancé, and her mom unexpectedly vague on the moral guidance front, it’s complicated. Things only get worse when Erin learns their television show’s director has a serious health issue. Fran wants to keep her condition a secret so she can continue working. Erin tries to keep things going without anyone finding out, but it’s a heavy load to carry, especially with all the other things she has to deal with. Like her boyfriend, who’s not really a boyfriend, just a “friend” friend. At least he was ... at least, that’s what Erin thought he was. He may have thought otherwise. Oh dear. The fifth book in Melody Carlson’s teen fiction On the Runway series, Glamour addresses issues more serious than this season’s styles. Not only that, they’re situations almost any girl can relate to: Friend issues. Boyfriend pressure. Family drama. Secrets to keep ... or not. Oh, and there’s a hurricane on the horizon—the real-life, threatening weather kind. 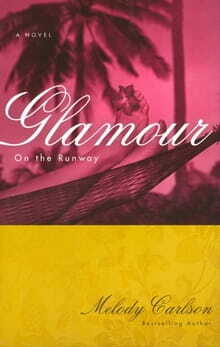 Despite enough unexplained details to fill one of Erin’s Prada bags, Glamour is a really good story. It’s fun to follow the sisters backstage to fashion shows, their own tapings, and even into a bit of reality TV land. The fashion sounds fabulous; there’s just enough description to provide a great mental movie, but not so much that the clothing overshadows the people wearing it. The settings are as stylish as the wardrobe; the girls turn up in poolside parties, fancy hotels, and beaches in the Bahamas—all part of the job, of course. All the characters ring true, from Erin’s “normal” friends to her boyfriend-obsessed sister to reality-show stars who create drama with every calculated, catty comment. Would I recommend Glamour? Absolutely. But do yourself a favor—read the rest of the series first.